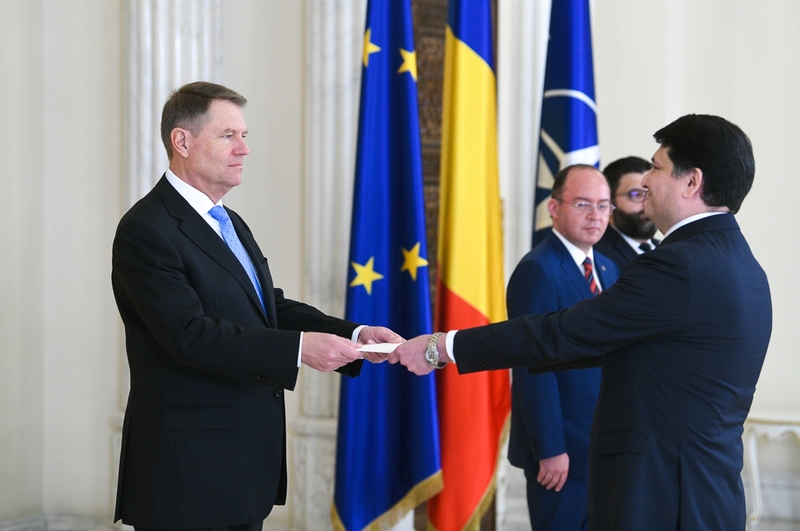 On January 29, 2019 Ambassador Extraordinary and Plenipotentiary of the Republic of Azerbaijan to Romania Dr. Huseyn N. Najafov presented his Letters of Credence to the President of Romania Mr. Klaus Werner Iohannis. On January 29, 2019 Ambassador Extraordinary and Plenipotentiary of the Republic of Azerbaijan to Romania Dr. Huseyn N. Najafov presented his Letters of Credence to the President of Romania Mr. Klaus Werner Iohannis at the Presidential Residence in the Cotroceni Palace. During the meeting with the Ambassador of the Republic of Azerbaijan, the President of Romania Mr. Klaus Werner Iohannis evoked the good bilateral relations, the Strategic Partnership between the two countries and encouraged their development, especially in the economic area to the benefit of both states. Moreover, President Iohannis underscored Romania's support, as the Presidency of the EU Council, for advancing the relations between the European Union and the Republic of Azerbaijan. In his turn, Ambassador Extraordinary and Plenipotentiary of the Republic of Azerbaijan to Romania Dr. Huseyn N. Najafov stressed his country's commitment for strengthening the Strategic Partnership, including at economic level, which reaches a decade in 2019 since its launch.